Gah.. September is over, which means we have like 2 months and a few weeks and its Christmas! I LOVE CHRISTMAS.I feel like all of my monthly favourites start with me being shocked about how close it is until 2015. I can't help it! So with a lot of these have longer reviews that I have posted so I won't go into extreme detail because you can go have a gander at the bigger reviews. I'm lazy I know.. Lets talk about my pretty pink blusher from the MAC Simpson Collection. I got this blush a few weeks ago and did a little cheeky review, pretty much within a day of receiving it. Yes i'm that obsessed! The colour gives me such a pretty glow which I love and although its not really an autumnal, I'm always happy for my skin to look all glowy and pretty. The next item just follows on with obsessing with things, as you would know if you follow my twitter. As soon as I picked up this Soap and Glory Archery brow tint pencil thingy and got home, I was completely raving about how amazing it is. I wrote a review within like 24hours as its just the bomb dignity. I say that word so much but I feel like you understand my love for something if I use it.. So the S&G amazing brow pencil thingy, literally makes my brows look so naturally defined as the tint end coats each brow hair making it look darker and fuller, giving you amazing definition. I am gutted that we don't get amazing lashes over here like they do in the USA and when I got to new York, I will be stocking up and they look soooooo much better than our ones! But I do have to put these ones in the faves this month as I am for one, loving the new Eylure packaging as its so strong and eye catching and makes the lashes look more attractive. 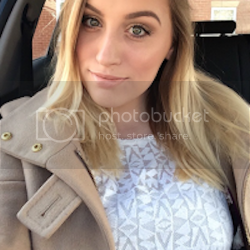 These ones are great for just pulling together a look and they can even be worn day or night and they just look like your lashes but longer and better. Who doesn't want that? Let's just talk about the hate I have for my lips being all dry and sore and gross. It truly is such a pet hate of mine as its so uncomfortable and I have rather large lips which means there is more space for them to get all chapped and horrid! Grr. My little beacon of hope during this stressful bad lip time has been the EOS balms. I only have the one as I'm saving getting another one until NYC, but this is the best thing I have used to put on my lips. I've heard a few people say it made their lips worse but it really has helped mine so so so much and for a lip balm, they smell lush and relatively inexpensive. WIN. Stay with me, we're nearly there. Onto this bottle of joy! I have to admit that I have been abusing my eyes and not being purchasing good products to wipe off my eye make up and I have suffered. I'm am missing quite a lot of eye lashes on my right eye and it is horrendous. If anyone knows any good ways to grow your lashes then please let me know and I need serious help!! 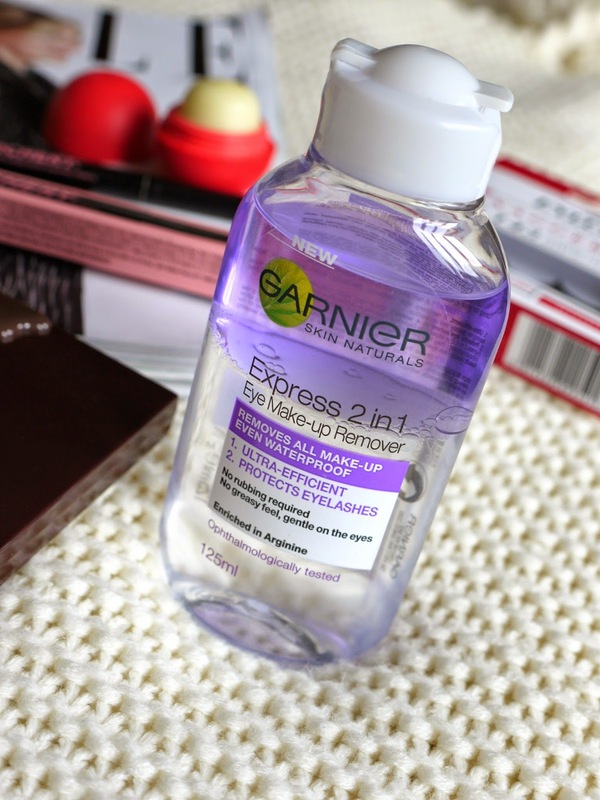 I saw the Garnier Express 2 in 1 eye make up remover and I thought I would give it a whizz as there wasn't much to lose considering how many lashes I have any ready lost and oh my word, this stuff is brilliant! All I do is apply some to a cotton round and just rest it on my lashes and eye make up, leave it there for about 20 seconds and the make up is basically off! No harsh rubbing or tugging needed. This is definitely a product I would recommend to anyone who wears a lot of eye make up. Last but of course not least, is my I Heart Makeup Death By Chocolate eye shadow palette. This has been my go to palette over the last month as all of the colours are so natural which makes them all very day friendly then theres shades in there to enhance or smoke out a day look which I love. Not only that, the shadows really are very blendable which can be really helpful if you're in a rush in the mornings. I did a review on it which you can check out here! I absolutely love the Garnier eye remover - I'm on to my second bottle! I really want to try the Soap and Glory pencil. The Mac Simpsons collection blush is a gorgeous shade! Love it! Those are some amazing color palette that would love to win. I dont own any of your eyeshadow but would enjoy have them. I NEED the I Heart Choc palette, it is LOVELY. I'm so jealous of the MAC blush, its stunning and I love the impressed Marge! !